The Original Harlem Globetrotters are back at the BMOHBC for their traditional New Year’s Eve tour stop on Saturday, December 31! A star-studded roster will have fans on the edge of their seats to witness the ball handling wizardry, basketball artistry and one-of-a-kind family entertainment that thrills fans of all ages. Tickets are now on sale for both the 1:00 p.m. and 6:00 p.m. games. Don't miss this great family-friendly event! 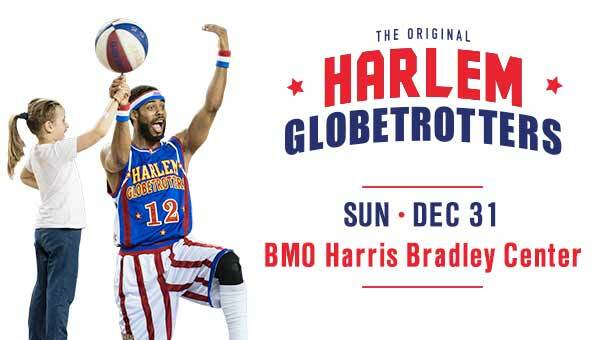 The Harlem Globetrotters will be at the BMO Harris Bradley Center on December 31 at 1PM and 6PM. They have generously donated TWO family four packs to see the show! How would you like to win a four pack of tickets?!?! One winner will win a family four pack to see the 1:00 show and another winner will win tickets to the 6:00 show!